DJ Fenris gains the text of the hosted identity. What happens if DJ Fenris is flipped facedown by Apocalypse? The identity remains hosted on DJ Fenris but has no effect on the game as it is not active. If DJ Fenris is turned back faceup, it will have the text of the hosted identity again. What happens if DJ Fenris is blanked by Dr. Lovegood? The identity remains hosted on DJ Fenris but has no effect on the game state as it is not active. At the end of the turn, DJ Fenris becomes unblanked and has the text of the hosted identity. What happens if DJ fenris is uninstalled while facedown or blanked? If an identity would ever be placed anywhere other than into the play area, it is immediately removed from the game. If DJ Fenris is uninstalled and then later installed again, can the Runner host the same identity as before on DJ Fenris? How does DJ Fenris work with Ele "Smoke" Scovak? At the start of the next turn after the Runner installs DJ Fenris (at step 1.3) the Runner places a credit on DJ Fenris, which can be used to pay for using icebreakers. DJ Fenris does not have a recurring credit until after his ability resolves, so no credit is placed on him when he is installed. Also note that DJ Fenris does not gain Smoke’s Stealth subtype. If the first card the Runner installs in a turn is DJ Fenris, and the identity they choose is Hayley Kaplan, can the Runner then install another resource using the newly gained ability from Hayley? No. DJ Fenris did not have the the ability from Hayley until after the ability's trigger condition would have been met. If the Runner is playing as Nasir Meidan and hosts Reina Roja on DJ Fenris, do they gain an additional credit when Nasir’s ability resolves? No. Reina only increases the rez cost of a piece of ice at the time the Corp rezzes it. Out of all the amazing cards in Reign and Reverie, this is the card that got people most excited. And I am not gonna lie, I am right up there with them. 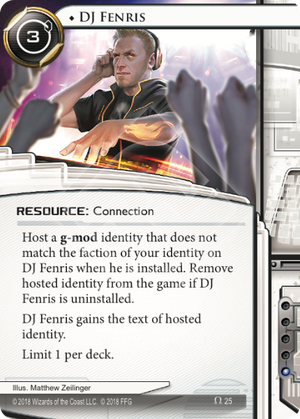 DJ Fenris is probably not the most powerful card in the set, but it is the most interesting one we have gotten in a long time. And it again makes me sad that the game is ending, so that we will never get new identities to explore his mechanic with. For the cost of three credits, you get to import the ability of a g-mod ID that does not match your faction. This is somewhat similar to yet very different from Rebirth, which lets you go into a different ID from the same faction, as you forego your original ability. The g-mod restriction limits the number of ID's by quite a bit and that last part is important, as it takes away some of the obvious combos that exist within the same faction. Still, what makes this card so exciting is the huge amount of possibilities that still remain, and how it is incredibly fun to basically play with a duo of runners instead of just an einzelganger. Noise: included because he is technically an option in casual play, but he is not legal anymore. Even if he were, only anarchs install a ton of viruses. While not possible, just thinking about him with Freedom Khumalo is giving me nightmares. Chaos Theory: there are plenty of cards that give you 1 MU and then some for 3 credits. Smoke: same as CT, you can get what you want out of her ID cheaper in a different card. The value in CT and Smoke as ID's is in their low deck size and their synergy with shaper cards, things you won't have as a criminal or anarch playing DJ Fenris. MaxX: your deck needs to be build around her mill mechanic to profit, and I don't think any non-anarch ID wants to trash their deck for 1 free card per turn. Kabonesa Wu: as with Maxx, your deck needs to be build around her ability to make this any good. She'd be solid in shaper, but alas. Geist: bad to mediocre in most decks, fantastic in (pirate) Hayley. More on that later. Reina Roja: good in the early and mid game to tax the corp. Bad late game. Los: again, good in the early and mid game as you get free money. Bad late game as the corp will have most their ice rezzed. If you are anarch/shaper you likely also don't have many cards to derez ice, so you won't get the full value out of this ability. Quetzal: usually meh, but potentially gaming-winning against Skorpios. Liza: situational, but the nuts in decks that can reliably get rid of tags through Citadel Sanctuary or runners who want to go tag-me. Steve: clickless recursion of power cards benefits pretty much every runner. Also gives you some inherent damage protection. Arguably the best choice for non-criminals. Hayley: saving clicks is always amazing. Good in most decks, but bonkers in Geist and any other deck that installs a ton of stuff. Two synergies warrant special mention. First off, the obvious one between Geist and Hayley. Pirate Hayley builds, with cards like Grappling Hook, Kongamato and Gbahali, receive a ton of tempo through Geist's ability, getting you free cards every time you use a trash ability. And he in turn goes into overdrive due to Hayley's ability to install two cards for the price of one, especially since he runs tons of cheap resources and breakers. Expect to see DJ Fenris as a staple in these decks. The other one is the mini faction runners, who can go into g-mods of any of the three main factions, giving them a ton of possibilites. Unfortunately Apex can't install non-virtual resources, so it is out. I can't say how good DJ is in Adam, as I am not that familiar with his play style. Sunny however, loves this card. Early game you can save a ton of tempo with Hayley, her link and need for draw makes Liza a prime target backed up with Citadel Sanctuary, and late game she can recur her power cards with Steve. Mommy's got a new friend! So yeah, if you couldn't tell already, I am in love with this card and want to put it into everything. And as it only takes up one deck slot and influence, I probably will. Just another great note for a bittersweet ending.